Happy Health-O-Ween everyone! 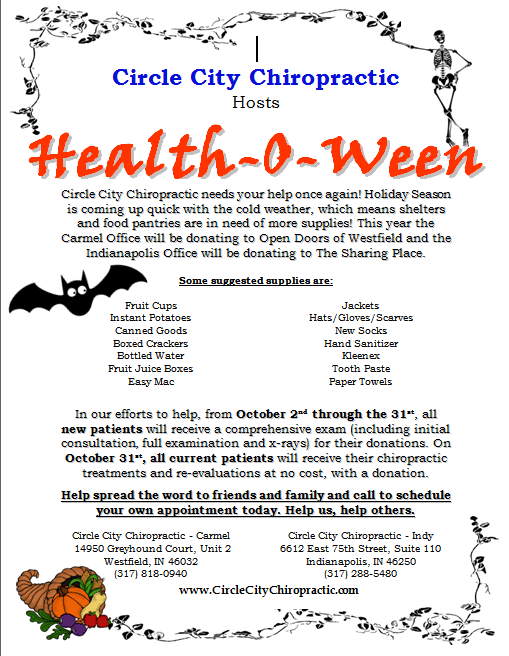 Circle City Chiropratic is hosting our annual event to gather donations for our local food pantries to stock up for the winter and holiday season! All month long, new patients are invited to bring a donation of non-perishable food items or winter garments (hat,scarves,etc) in exchange for the cost of a chiropratic consultation, examination and e-rays! Over at $275 value! And all existing patients will receive free care and a party with food to celebrate them for bringing donations! The Carmel Office will be donating to Open Doors of Westfield and the Indianapolis Ofiice will be donating to The Sharing Place.